Electrical disturbances can create problems in the power that runs your equipment. Whether the interference comes from sources inside or near the facility (motors, air conditioners, vending machines, arc welders, etc.) or from sources outside your facility (lightning, power company, accidents, radio transmissions, etc. ), it can create havoc in the sensitive electronic or computer equipment you depend on. Equipment can operate erratically and hardware and software can be damaged. Computer files can be garbled or lost. The Energy Technologies' Tactical Inverter® System will help you overcome these problems. Unlike most power Inverters on the market, the ETI Tactical Inverter System is a rugged, high-reliability, piece of equipment that will provide the highest quality power for your equipment. It is designed to take wide range DC sources including vehicles, aircraft, generators or battery banks and produce Computer-Grade AC power. 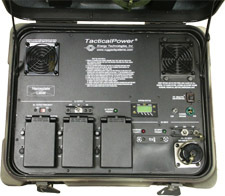 The primary use for Tactical Inverter units is for a vehicles battery to power up the inverter. Inverters can function from any vehicles's DC battery. The inverter then provides clean sinusoidal AC, which can power many vital pieces of equipment. 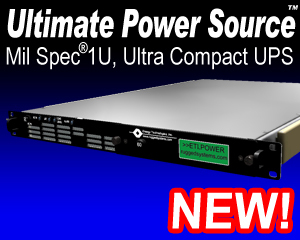 • In conjunction with ETI's rackmount Power Distribution Units (PDUs) , you can power multiple pieces of equipment at once. ETI also offers Tactical PDUs in portable transit cases, or configured as part of other larger product offerings. • Overall, the TacticalPower line is uniquely qualified for critical vehicle and land based systems combining advanced modular design features with highly reliable construction.